Ever since the technology was first applied to televisions the potential has been obvious with the absolute blacks, fast response times and wider color gamut providing a tantalizing glimpse of the future. Higher resolution is one thing but there is so much more to an image and OLED is the next stage in the evolution of TV technology. The Samsung KE55S9C features the company’s true RGB OLED technology, a curved screen, quad-core processor, inbuilt Free-view HD and twin Free-sat tuners, active-shutter 3D and Multi-View functionalities, as well as the brand’s Smart TV platform which is the only one offering all the major catch-up TV services in the UK (BBC iPlayer, ITV Player, 4oD and Demand 5) at this time of writing. Although OLED TVs have been in the pipeline for a while, the first consumer models are now making it onto the high street. In the coming years, OLED TVs are likely to take over from the LCD and plasma models that currently dominate the market. The Samsung KE55S9C offers further proof that the OLED revolution is now well and truly upon us, with a TV that combines stylish design with excellent image quality. Whether for its look and build, its contrast, its screen response times, its 3D quality or its ability to keeping reflections at bay, the KE55S9C sets new standards across the board. It even out-performs its number one rival, the LG 55EA980W, on several fronts … although not in every respect! 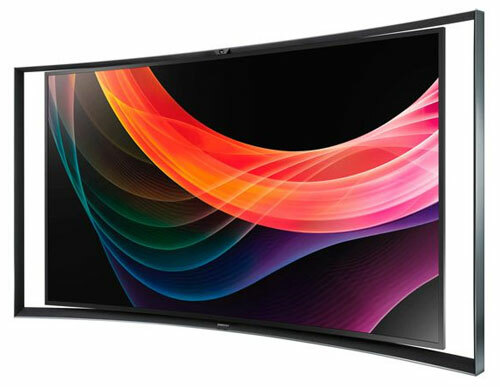 We’d like to thank the Boulanger consumer electricals store for letting us into their Orgeval showroom just outside Paris to lay hands on Samsung’s 55″ (140 cm) KE55S9C curved OLED TV. The S9C is the first OLED TV to hit our test bench, and also the first curved display we’ve ever reviewed. Three Fast M.ZUIKO PRO Lenses Cover From Ultra-Wide-Angle To Telephoto At f2.8.